Its New Year's Eve in Seattle. I had spent my first Christmas on the west coast, cut down and decorated a 10 and a half foot Christmas tree, watched "Its a Wonderful Life" several times, and spent the night on the couch Christmas Eve at my Aunt and Uncle's home north of the city. I didn't fly back to the east coast to be with my parents for Christmas, (I'm an only child), mainly because I was exhausted by all the plane travel I was doing on a weekly basis for work. My exhaustion was actually extremely severe at the time and what I didn't know and would find out months later, was that I was suffering from an autoimmune disease. My body was attacking itself. I spent most of the Christmas Holiday sleeping. It was New Years Eve and I had been invited to a party by one of the only persons I knew in Seattle, my hair stylist. I didn't know the hosts well and had actually never spent time with Robin and Ray on a social level, in fact had never met my acquaintances' partner. I remember Robin saying when he invited me to their house, "you know everyone's going to be gay, right?" I had been single for 4 and a half years, going on five and a half now, but who's counting? I am. I thought, "I don't freaking care, Thank God I wont be alone on New Years Eve." New Year's Eve was actually a beautiful day of sunshine in Seattle (its a myth that it rains all the time). I got in my car to go get a host gift for the party later that night, down the hill from me I had discovered this gorgeous little craftsman style renovation that turned out to be a 3 generation collaboration hand welded whiskey distillery. I thought a bottle of nice whiskey would be an apropos gift to bring, much later Robin and I would laugh at how silly it was of me to think whiskey was a good gift to bring to his house. "Do I look like a man who drinks whiskey?". I would have done better bringing something a bit more refined, but what the hell did I know?! I took a residential street off the back of the hill in my neighborhood. 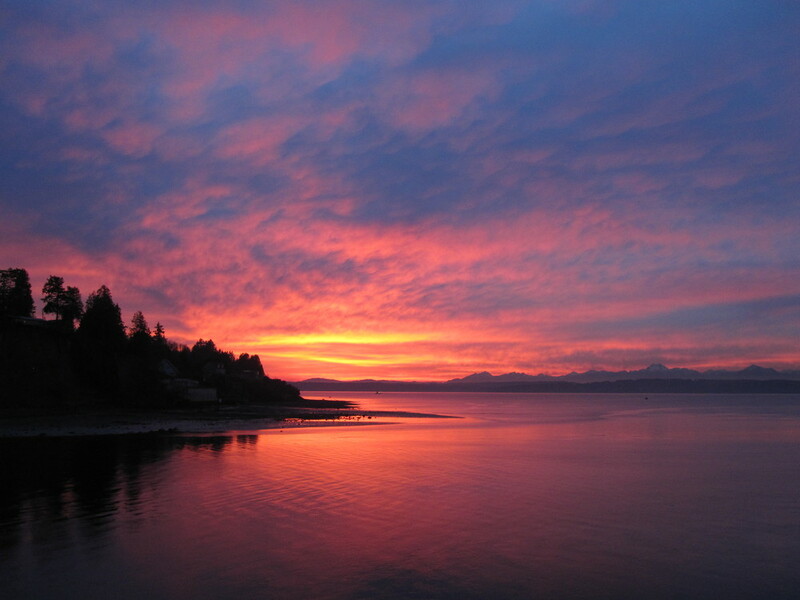 No one ever mentions the steep terrain in the city of Seattle, San Francisco is known for its precipitous hills, Seattle for the grey skies, no one ever mentions the massive slopes and pitches in the city and the awe inspiring sunsets surrounding the Puget Sound. I came to a stop sign and looked to my right and then to my left and saw a human body smeared across the pavement. Time warps. I leave my seat behind the steering wheel so fast that my car begins to roll and I get back in to throw on my parking brake. She is laying there. Head first into the pavement, her face is obscured by her helmet and her neck and body are crumpled and piled behind the point of impact of her head. A bicycle accident, but I don't remember seeing her bicycle. I will never forget seeing the first drop of blood land on the pavement falling from her mouth. And then the pool of blood that would form under her still obscured face. Blood is black and thick outside of the body, thick and black even against the dark pavement. She wasn't breathing at first, because I remember when her breathing began again. There aren't words to describe a breath like that, its the death breath. The unconscious breath that happens when your body has gone into pure fight for survival. The breath that happens when you are precisely at the point that if you do not take another breath, there will be no more breaths in this life time. Blood and breath. Blood and breath. Blood. I'm paralyzed a few steps away from her, other people are talking to her, someone made the "call 911" command. I'm standing there looking at her arms. Her arms are thrown about her helmet like pieces of a rag doll puzzle that came apart, broken, twisted, distinctly unnatural. I remember this scene, it feels familiar, but not like deja vu. In the time warp, my body is nailed to the pavement, as if time got sucked into my mouth and time is so heavy inside my body that its rendered me immovable. No one has moved her, because its obvious that her head, neck, and body are traumatically disassociated. I'm not sure how much time goes by, but I'm not helping at all. I get back in my car and drive through the intersection and park on the next block. I watch the ambulance arrive, I can't see her anymore, I don't see how they pick her up off the pavement. I wait for them to turn on the lights and pull away. Time goes by. I think maybe they are stabilizing her. Time goes by. They never turn on the lights. Time goes by. The ambulance pulls away. They never turn on the lights or the sirens. I follow the ambulance down the street, it pulls into traffic and goes over the bridge to Fremont. They never turn on the lights. They never turn on the siren. I pull off to the side of the road again and lose it. Sobbing hysterically I call the only person I know in Seattle, he doesn't answer. Then I call my mom in Virginia. I'm losing it, sobbing and crying but I manage to say "Mom, its not me. I'm not hurt." I cry hysterically. Time goes by. 7 years prior, I had been in a serious motorcycle accident and had totaled my motorcycle when I hit a patch of gravel in a 90 degree off ramp and smashed the guardrail going about 40 mph. I broke both my arms and mangled my full facial helmet, but suffered no injuries to my face. I had 2 surgeries on each arm, donor bone was inserted in to my right arm to help meld the crushed pieces back together. I spent 18 months in rehabilitation and therapy and still have pain and nerve damage in both my arms. But I never thought much about it. I am fine, my fingers work, my hands work, I walk, I talk. I always joke, "We know how the story ends, I survive. I'm right here. " Witnessing this scene, I know. I see. I feel the impact of a life. Its New Years Eve, she had plans. And I don't care if she didn't believe in New Year's resolutions, there's no way that she wasn't thinking about the coming year. She was on her way somewhere. Someone is waiting for her. Someone is going to get a phone call. People's lives will change for-ever. Every-thing changes in an instant. Life goes like that. One moment you are here, the next moment you are not. The body is a miracle, the heart pumps, the lungs filter, you never have to think about it. Until you hit a patch of gravel on the road and you're dead. That's it. New Years Eve and you're dead. That's it, life is that miraculous and that fragile. It was like that time Benjamin socked me in the gut in kindergarten when we were waiting in the lunch line because I said I liked him. The wind was knocked out of me and my reflex for taking more air into my lungs had been suspended by the hit. EVERYTHING IS A MIRACLE. There was no other explanation. Before it had just been a convenient saying by an intelligent man, a respected scientist, now it had become an inarguable fact, a law of the universe, a scientific rule. EVERYTHING IS A MIRACLE. I am alive for a reason. I could have been dead seven years ago. Why am I alive? I went to the party that night and swore that I wouldn't be the party guest that kept telling the story of the tragic accident she witnessed on her way to pick up a party gift. After the ball dropped, I found myself telling the story to Robin and he, in turn, shared a life changing story of his own.... we were drunk and talking about life and death. I called the cab company 24 times that night, but in the morning I was sleeping on Robin and Ray's couch in my hot pink party dress.... and as Ray likes to chide me "When I woke up and saw you sleeping there, I knew we were never going to get rid of you." And that day will forever be the turning point, when everything changed in my adult life. I woke up. I didn't exactly receive a clear download from the heavens above with a to do list and a map. But I got the message. "You're alive for a reason. You better damn well figure out what it is, sooner rather than later. How much more time are you gonna waste being half alive?" I was living a half life.